Wellington Chase is an attractive option for prospective homeowners looking for a prestigious Palmer Ranch real estate with a great location sans the hefty HOA fees. A non-gated community of single family homes, Wellington Chase real estate feature beautiful residences in a lush master planned environment. Situated north of The Hamptons on Palmer Ranch and just beside Serenade on Northridge Road, this purely residential community is great for growing families. Each Wellington Chase real estate sits on priceless serenity within the cozy community, adding value to its charm and general appeal. The quiet, suburban feel is accentuated by the numerous lakes—most of the properties enjoy scenic lake views—and thoroughly preserved woodlands. 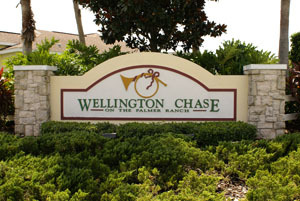 Wellington Chase homes for sale are priced between the low $200s and the mid $300s. There is a variety of floor plans for the two to four bedroom homes, mostly built with its own swimming pool. Living spaces range from 1400 to 2600 square feet of this two-car Palmer Ranch real estate property. Although the community does not have its own amenities, there are certainly plenty of activities to engage in at the surrounding areas. A game of golf can be pursued on the excellent 36-hole course of TPC Prestancia and the 18-hole course of Stoneybrook Golf & Country Club. Tennis can be played on any of the 19 superior Har-Tru courts of Serendipity. The racquet club also has an Olympic size swimming pool and offers spa services, as well as wellness classes and programs. All three clubs regularly hold social events, such as bridge and trivia nights, dance parties and live entertainment, and of course, sports tournaments. The Family YMCA on Potter Park Drive offers a highly advanced strength and cardio center, basketball and tennis courts, an Alpine Climbing Tower, and swimming pools for leisure and training. The Selby Aquatics Center has two water facilities that are both fun and safe for adults and children—even toddlers. Residents can also have fun at Livingston’s Amusement Center on Clark Center Avenue, just a short distance northwest of the community. To the north of Wellington Chase is Clark Road, where several restaurants, banks, and shopping centers are located. To the east is I-75, which provides quick access to anywhere in the metro. Route 41 (Tamiami Trail) on the west is also home to a number of shopping and entertainment centers, and leads to the best beaches in Sarasota.